I love days when there are no plans scheduled. Awoke early this morning and Kim and I took a walk, in the mist, to Buck's for breakfast. When I got home I went to work on applying for the VA benefits for my Mom. Her bank accounts are dwindling and she is still physically healthier than most people half her age so I am getting nervous. I have visions of having to go back to work to support Mom's Memory Care Center. Went to visit Mom and drop off paperwork for VA that needs to be filled out by the attending physician and then went and did a little more Christmas shopping. 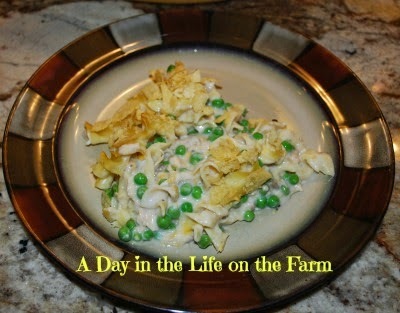 I have a chicken in the pot that will become tomorrows supper and I am making Tuna Noodle Casserole for dinner tonight. This is the first Tuna Noodle Casserole I have made in 22 years. We used to have Tuna Noodle Casserole for dinner quite often when the kids were young but then when Frank and I got married he didn't like tuna so it was never made again. Then a couple of years ago I was making one of the greats Kraft dinner with tuna for lunch and Frank actually ate some of it so I thought "what the heck" I'm going to make it tonight and see what he thinks and if he hates it....there is still leftover pot pie for him to eat. So this is my Tuna Noodle Casserole that I think I found on the back of a Campbell's soup can many years ago. It was my kids favorite version so I stuck with it. I hope you enjoy it as well. Frank opted for the Leftover Beef Pot Pie but I thoroughly enjoyed my Tuna Noodle Casserole. 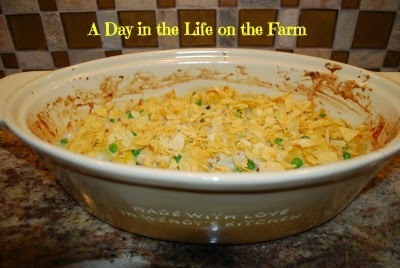 Combine all ingredients except chips in a casserole. Scatter crumbled chips on top. Bake at 350* for 30 minutes. *Note: I don't add any additional salt due to the saltiness of the soup, fish and chips but feel free to add salt to taste. Today is the first day of the 31 Day Challenge, hosted by The Nester and co hosted by Kate Motaung of Five Minute Friday. The Nester challenges us to write each and every day in October on one topic. I am not sure that my pledge to write fiction each day qualifies as a topic but I am doing it anyway. To make things even more interesting, Kate, has challenged us to limit our writing on said topic to only 5 minutes a day using a different word prompt each day that she has provided. We will see how it goes...wish me luck and please stick with me during this journey. I will gladly accept any feedback you have to offer. This is completely new territory for me. I couldn't move. I was paralyzed with fear. I had heard of this happening but I didn't believe it was real. How did I come to be here? How could I have been so blind, so stupid. It had seemed like such a good idea. He was charming, rich, handsome....everything I had dreamed of finding in a man. Was that what happened? Was I so enthralled in my dreams that I was blind to the truth? It had sounded so innocent, so perfect. Let's move away together, just you and I. Somewhere we can call our own. Somewhere secluded where no one else will be able to bother us. It will be just the two of us, he said. Our own little paradise. We were entertaining the first time I got a view of the Island. We had 50 people on the yacht and as I stood at the side of the boat looking over the railing he said "See that Island there?" It was breathtaking! Imagine my excitement when he got down on one knee and proposed telling me that he had bought that Island just that week as a wedding gift for me. I stood there flabbergasted as all of our acquaintances, friends and family began to applaud. They had all known...they were all in on this little surprise. I couldn't wait to accept his proposal. I couldn't believe that this fairy tale was my life!! As I looked out among the crowd I viewed my best friend, Lila, with a frown upon her face. Unfortunately, this was nothing new. Lila had a look of consternation on her face every time she was around him. She says she is worried about me. That he is too controlling. That I am blinded by my infatuation with him. Why can't she see him as everyone else does? Why can't she just be happy for me? I think she is just jealous because I don't have the spare time to spend with her. We used to do everything together. Go everywhere together. It was such an easy, relaxed atmosphere. I could tell her anything. We could talk for hours. It is true that we haven't gotten to spend as much time together, but he hates not being included when we go places and I do things. Lila asks why he always has to be with me...she doesn't understand a love like ours. I find myself avoiding her sometimes because I know that she disapproves of this relationship. You would think after all these years of being friends with Lila I would have learned that she always had my back. All I can say is I was blind...I didn't see the truth that she was pointing to. I told myself she was jealous. I told myself she didn't understand. I told myself she was wrong. I convinced myself that she wasn't really my friend. So when he told me that he really didn't want her around too much anymore because he felt that she was judgmental and bitter, I agreed with him. I slowly started making excuses when she wanted to get together. I quit answering the phone. My texts were terse with a "sorry, I've been busy" air to them. Finally her calls came less and less frequently. Those few times that I did take her calls, I pitied her for her insecurities. I couldn't wrap my head around why she refused to be happy for me. I was angry that she constantly wanted to talk about how I had "changed". How I was "losing who I was". But I didn't listen. I didn't want to hear. And now I am stuck here. I have no one to whom I can turn. I am alone. Stuck on an Island with a mad man and everyone thinks that I am living the life!! The only person who could know that I am not living the life was Lila and I pushed her away. It began very slowly, this total isolation, and I was so happy, so in love, that I did not see it happening. First the staff started being let go one by one. Nobody could seem to do the job properly in his eyes. And finally he quit replacing them, saying we were better off doing it ourselves. Maybe it was my fault. It started with Cook. Cook was wonderful and her food was delicious but I missed being in the kitchen so I simply asked that we give her extra days off so that I could start cooking again. I can hear Lila's voice in my head right now..."Don't be ridiculous, how were you to know that he would take that as an excuse to fire the cook". She would be admonishing me right now to not allow him to make me the bad guy in this scenario. She would have my back as she always did. Oh, how I miss her. I know that I screwed up. I know now that when something looks too good to be true that it usually is. But I didn't know that at the beginning. I was too busy. Oh, it was so much fun making plans for the house, taking day trips over to the Island to see the progress on it. He let me have anything I wanted..."only the best for my wife", he would say. Once the house was built, months were spent decorating it. Oh and the travel....because if you want Persian rugs you go to Persia and if you want Italian tile you go to Italy. I didn't have time for anyone else. I slowly let all those relationships slip away. He does still allow me talk to my Mom once a week but only when he is present to monitor my end of the conversation. I don't know how I let this happen. I am not a stupid woman...just a naive woman, I guess. "There you go again" he says. "Why can't you just be content with all the good things I've given you?, You are always complaining, always wanting more". Every time I broach the subject of leaving the Island for a while. Of going to see my mom or having a party with some of our friends that we haven't seen in so long. I just want to go somewhere, anywhere. He asks why I would want anything more. Is he not enough for me? Does he not dote on my every little whim? Yes, I want to scream, YES, YES, YES. You dote on me constantly. I can't go to the bathroom in peace. I can't shower alone. I can't read a book. I have no computer, no phone. I can't go for a walk alone. I can't breathe!! What can I say? I don't understand myself why I thought his cloying neediness was so cute. I didn't see it for what it was. Now I am suffocating here. He says that he loves me but this is not love. I am not sure what it is but I know that love should not make you feel like a prisoner. The next person to be let go was the upstairs maid. He said that he caught her snooping around in our personal areas. When I asked who we would get to replace her he said that we would take care of the upkeep in our bedrooms and sitting rooms. I asked what about when we had guests, and was it my imagination or did he hesitate for a moment, like there was no reason for him to have considered that, before replying that we would hire temporary help while entertaining. I am not sure what happened to the internet service. It went out, or so he said, and it still hasn't been fixed. He says it is hard to get the internet provider to come out to the Island to fix it but he had no problem at all getting them to come out to install it. It quit working shortly after friends of ours posted on facebook that they were planning a trip to Costa Rica and asked us to join them. I thought it sounded like fun but he didn't want to go. He complained that our friends were immature and childish. It was going to be nothing but a drunk fest and he did not feel like joining in. I was very disappointed and then when we got this photo from them showing that it had been a fitness vacation, he got angry that I was bringing it up again. He didn't understand why I felt the need to join our friends in everything they did. He didn't understand why I wasn't happy spending time with him. I tried to explain to him how I loved spending time with him but what about other people? What would they think if we always ignored them and turned down their invitations? He said he didn't care what others thought and that neither should I. The only person whose opinion I should care about was his. I tried to tell him that his opinion was very important to me but that I didn't know what to say to people when they asked why we were not being sociable anymore. They thought they had done something wrong and we didn't like them anymore. I wasn't able to answer their questions. A couple of days later...I couldn't find my phone anywhere. I searched high and low...it was gone. He said that the downstairs maid must have taken it and the next thing I knew, she too, was gone. I don't believe that the downstairs maid took it. I believe he was just trying to teach me a lesson. I asked him to please let me hire a replacement, that there was no way that I could tend to this house on my own. He said that I needn't worry about the whole house, after all there were only the two of us and I never used all the wonderful things that he tried to give me...the pool, the gym, the sauna...instead I kept myself to the kitchen where I ignored him because I was busy cooking or in my room where I turned my back to him and cried myself to sleep. Did I think he didn't hear me at night? he asked. I made him feel guilty and he didn't appreciate my weeping and feeling sorry for myself after all that he had done for me. I said that my cooking was for him...to make him happy and that my tears were just because I was lonely. He can't understand why I would be lonely when he is right here beside me all day, every day. I try to act cheerful when he is watching me but he is always watching me even when I think he is otherwise occupied. Was it really only 2 days ago that I was so excited? That I believed things were turning around? It was time for my weekly phone call to my Mom. As he handed me the phone he said "Let your Mom know that I have to go out of the Country on some work business so you won't be in touch with her for a while". I was so excited..... I asked where we were going and when we were leaving. I love going on business trips with him. I would shop while he was in meetings during the day and then we would go out to dinner, dancing and sight seeing each evening. We would laugh and joke around and make love until the wee morning hours. I couldn't believe that finally, life was getting back to normal. He said that he had work meetings in various cities and would be travelling Europe for several weeks. I was so excited when I spoke to Mom. And she was excited for me. The next day I awoke early and ran downstairs to ask him how I should pack. I ran into to kitchen, thinking that perhaps he was making coffee but he wasn't there. I ran out to the porch thinking he was drinking coffee but he wasn't there. I ran into the living room and saw the letter telling me he had gone away. "Don't think for one minute, my dear, that I don't listen to what you say," he wrote. "I spend my life striving to make you happy. You said you wanted some solitude, that I was smothering you, so I decided we needed some time away from each other. I will be back when my work is done. I have given the grounds keeper the next month off and Captain will drop me at port and wait in the City for my return. Enjoy your time away from me and think about how much I love you and want to be with you." I read that letter and chills started going down my spine. What did I do....what kind of life was I going to have, married to this mad man. I can't believe he left me here on this island, all alone,with no way to make contact with anyone or anyone to make contact with me. Not even him!!! What if something happened to me? What if I got sick? What if I broke my leg? No. NO. NOOOOO. I am not going to allow myself to go there. I am NOT going to let him knock the life out of me. He is NOT going to dictate my life! I just need to keep a clear head and think. He is trying to keep me frightened. He is trying to prove that I am completely dependent on him...that I have no life without him. I spent the next days, while he was gone, walking the Island and thinking. Thinking about how I was going to manage to get off this Island. I need to adjust my behavior to regain his trust. I needed to make him believe that his plan of proving to me how much I needed him, how dependent I am on him, worked. I needed to adjust my behavior back to how it was with us in the beginning, when I thought his constant neediness was endearing and proved how much he loved me. So I made a plan, and adjusted and tweaked the plan until I think it is almost fool proof. Now just to await his return...it has been nearly a week....I wonder how long he thinks my punishment and exile should last? It has been 12 long days since he has been gone. I have walked this Island, which measures 2 miles by 4 miles at least 3 times each day. I have cleaned the entire house, 7200 square feet, from top to bottom. I am nearly out of food. Surely, he would not leave me here without any food. Would he?? I have never been in such isolation. There is no radio, no television, no computer, no phone. Just this notebook in which I am sharing my story, and I may have to burn this when (if?) he ever returns. I must stop this....of course, he is going to return and then, at long last, I can put my plan in to effect.I am going to get off of this Island, one day. I promise myself that! Well he finally got home 3 days ago. I have such a bad taste in my mouth but I am swallowing it along with my pride. When he finally came back, I ran to him. I grabbed him and went on and on about how much I missed him. I told him over and over how much I loved him. I acted like he had given me the world as Captain unloaded the groceries he had brought back with him. I took him inside and made him a drink. I sat with rapt attention as he told me all about his trip. I told him how much I wish I could have been there, not to see anything, but just to be with him....to be held in his arms. I made his favorite meal and then we fed each other champagne and strawberries as I told him how I hadn't realized how much I had taken him and his love for granted. I vowed to him that it would never happen again. Each day I have followed him around like a puppy. He has asked me twice so far if I want to call my Mom. I have told him there is plenty of time for that. That right now the only person I wanted to talk to or be with was him. I tell him that while he was gone I spent a lot of time thinking about our Wedding vows and how I promised to love, honor and cherish him. I apologize for failing to live up to those promises. I choke on the words but I force them out and I am rewarded with a gloating "I told you so" look before he takes me in his arms and tells me that it's okay. That he knew I just needed time to learn what was important. That was why he was limiting my contact with others. That is why we needed to stop entertaining and going on vacations. So that I could learn. So that I could see...what, exactly....those Wedding vows meant. He knew I would...He had faith in me....I just needed a little reminding. Oh yes, I agreed. I am so glad that he is so smart and knows me so well. What a wonderful husband he is and how lucky I am to have him. I have to stop myself from putting it on too thick. I don't want him to get suspicious but I need not worry....his ego is huge!! I need to swallow this fear I feel. If I am ever to make this plan work, I have to get over this fear. Yes, I will be taking a chance, but what choice do I have. I can fight my fear and take this chance or I can live the rest of my life in this exile he has created for me. Lila knows the code. She will remember the code and she will come to my rescue. She always has. I just need to get that code to her. I remember the first time we used the code....was that really 20 years ago? Whenever one of us would go on a blind date, the other would call at an appointed time. If things were not good the person on the date would ask what time the appointment was the next day. Of course, it was very early which would give us a reason to say goodnight and end the date. I just need to get this message to her. I can't call her directly...he would never fall for that. I was unable to put my plan into effect the first time I spoke with my mother. He was right there next to me the entire time so I told her all about how wonderful our trip to Europe was and how happy I was to be home. I told her how wonderful he is and how complete my life is. All the things that I wish were true. All the things my Mom would want to hear and all the things he expects me to say. The second time I spoke with my Mom we were having a glass of wine and while speaking with her on the phone I emptied my glass. He got up to refill it for me and I had my chance. I didn't waste a second because I didn't know how long he would be gone. I reminded Mom it was Lila's birthday and when she called her could she please ask her what time my appointment was. Mom started to question me but I quickly assured her that Lila would know exactly what I meant and it was important. He walked in just as the last words were out of my mouth so I just kept rambling on about how much I missed her and that he has promised that we will be coming home to see her in the very near future...just as soon as his work allows. Now I awake each morning and I have no idea what to expect. I don't know if my mother made contact with Lila. I don't know how Lila will react...but I know she WILL react. I don't know how he will react if Lila suddenly shows up on my doorstep. I don't know how she would get here or how she will convince people that I am in trouble. My entire life is hanging in the balance here and I just don't know what to expect or when to expect it. And he says I am acting strange. That I am jumpy. I need to be very careful because I don't know what to expect should he suspect anything. I am trying to keep up the charade...we go for walks, we watch silly love stories, we read on opposite ends of the couch. Last night he asked if I wanted to go to New York City for a few days. I wasn't sure how to respond. What if I am gone when Lila comes and why, after all this time, does he suddenly want to take me away somewhere. Oh, I pray, Lila comes through soon. How would it look if I refused to go with him now when I had been asking and asking to get off this Island? I am so worried that Lila is going to come looking for me while I am gone. I will have to contact Mom and let her know. Hopefully, she will talk to Lila and let her know. He awoke me early this morning and told me to pack up that we were leaving in an hour. An hour!! I told him I should call Mom and he said we can call on the way to the airport. Is it my imagination or is he looking nervous for some reason? Why is he so anxious to be on the way, all of the sudden? When I ask him if everything is okay he says that he is just dealing with some work problems and has an important meeting to get to this afternoon. On the way to the airport I call Mom and tell her that we are going to NYC and I will call her when we get there. She asked when we would be returning and when I asked him he said that he didn't know and I should get off the phone we were running late. How Dare he....now I am sitting here fuming inside as I sit next to him with a smile on my face pretending like I am pleased as punch that he is so "clever". What I would like to do is punch that smirk right off of his face. I couldn't believe when we got to our gate and the flight was for New Orleans. Aaargghhh. "I thought we were going to NYC?" I asked sweetly. "Oh this is a surprise for you...you have been to New York City but you have never been to New Orleans and I wanted to surprise you with it". Now Lila will be looking for a way to find me in New York and I won't be anywhere near there. I am sitting here next to him in the plane while he explains that there was no business trip...he just thought he would surprise me with a vacation. I am stunned when he adds "I am just so sorry that it interfered with your visit from your mom and Lila". Praying that he thinks the surprise that registered on my face was because it was news to me that they were thinking about coming and not that he knew that they were coming, I asked tremulously what he was talking about. He replied that Mom had called him to let him know that she and Lila were going to surprise me with a visit and wanted to make sure we were available over these dates. He had to tell her that we, unfortunately would be out of town, and he would get back to her on when it would be a good time to visit. I closed my eyes and laid my head back, fighting off the tears that were threatening to spill out. Poor Mom, how was she supposed to know that the surprise was supposed to be on him not on me. He asked if I was okay and said that he was sure that I would much more enjoy going on vacation off of the Island than entertaining my Mom and Lila on the Island and besides he knew that Lila was not one of my favorite people so perhaps we could arrange a time for Mom to come without Lila. Yes, when monkeys fly you will allow my mother to come, I thought. I kept my eyes closed, pretending I was drowsing, I could feel him watching me. Keep your face relaxed, I told myself, breathe evenly, let him think you are sleeping and THINK....Think about this. It is not the end of the world. So they think you are going to be in NYC when in actuality you will be in New Orleans. Not the end of the world. So their visit was interrupted. Not the end of the world. We have been here a couple of days now and it was going much better than I had feared. He was, of course, right by my side every minute of every day since there was not really any work meetings, but he did allow me to go and get my hair done and we went shopping and when I asked to get a massage, he agreed ..... and then set up an appointment for a couples massage! Then at dinner tonight, the bombshell landed. I asked if perhaps when we got back to the Island we should call Mom and set a date for her visit. He said that he was planning on waiting with this surprise but now that I brought it up he had some good news for me. He said he knew how much I hated the Island and the solitude so he was selling it and we were moving to Europe. How would I like a Villa in Spain?? I was flabbergasted...."but what about my mother?" I asked out loud..."how am I ever going to get free?" I asked myself. "Your mother can visit us there". "I will fly her out each year over the holidays". "I would never let your mother spend the holidays alone". He went on and on about how wonderful life was going to be. How we could live on the ocean but not too far from town because he knew how lonely I got on the Island. He thought this would be the perfect solution to the problem and besides he needed to spend so much time in Europe now for his job and he didn't want me to be stuck home, alone, on the Island like before. As I lay in bed, all of his words, all of his veiled threats run through my head...It won't be so bad, I think. It will be nice to have some freedom again and if we are over there and he knows I have no passport, no money, no real knowledge of the language, he will relax and I can live a normal life. All of the sudden I hear Lila screaming in my head "Wake Up!!!" I can hear her asking...are you crazy...you are NOT going to Europe with this mad man....he could kill you there and no one would be the wiser!!!! "Of course, I will follow you wherever you go", I say to him the next day. We are united, like two pieces of a puzzle. I am incomplete without you. He holds me close and tells me how happy he is that I can understand that this is all because he loves me. He promises me he will do everything in his power to make me happy. It is all he ever wanted. I reassure him that the day we were united in marriage was the happiest day of my life and that I understood how completely our lives were intertwined. I tell him I was happy to forsake all others for him and how much I appreciate that he is so good to my mother, paying her bills, hiring a companion because I couldn't be there with her all the time as I once was. He gives me an indulgent smile and tells me again that it is all because he loves me so much. I ask when we are leaving for Europe and he replies in the next day or two. I panic in my mind as I smile sweetly and tell him how excited I am for this new chapter in our lives. The first thing this morning, when breakfast was delivered to our room, I lifted the lid off my dish and found a package wrapped up on the plate. I opened it to find an Eternity necklace from Tiffany's. As he put it on me he casually mentioned that after breakfast we needed to pack. Our flight to Europe was this morning. I tried to control the panic in my voice as I asked about all our things and the packing to be done and the people to say good bye to and he just smiled his indulgent smile and assured me that he had everything taken care of and I needn't worry myself. I looked in the mirror at my Eternity necklace and promised myself that this was not going to be eternity for me. I must make my move quickly before we get on that plane. We were standing in line to go through security at the airport so we could leave the country, when I suddenly realized that my necklace was gone. I frantically told him that my necklace must have fallen off in line somewhere and started scrambling around on my hands and knees looking for it. He started looking as well and he went in one direction as I started in the other. I got near the edge of the checkpoint, glanced over and saw him still looking and grabbed my chance. I dashed through the line, pushing others out of my way and past the checkpoint as fast as I could. All of the sudden there were flashing lights and sirens going off and I felt myself being tackled from behind. As I was laying on the floor, I could hear him screaming "That's my wife, I need to get to my wife". As they cuffed me, I heard them saying "Sir, your wife is under arrest, you cannot go past this checkpoint". They stood me up and I caught his eye as I slowly released the necklace that was in my fist and allowed it to fall to the ground. I then turned to leave with the officers. I wonder how long before I can make my one phone call and I pray that Lila is available to accept the call. I am sharing this first attempt at fiction writing at Wednesday Whatsits where a bunch of us bloggers post what has been going on in our lives. Jennifer of Inner Workings of the Female Mind nominated me for the Liebster award. This is an award given to new bloggers or bloggers with less than 200 followers. It is an opportunity to get to know other bloggers and to help them increase their readership. Thanks Jennifer, I think I will accept the nomination and happily participate with you. Nominate bloggers with less than 200 followers to do the same. Advise those bloggers you nominated that you chose them. I start humming the minute I start cooking. I don't realize it until I catch myself. I start cooking the minute I feel stressed. I cry when sad songs come on the radio as I'm driving. I don't think you can ever have too many kids running around the house. I have unfinished craft projects stuck in nearly every closet of my house. My favorite Holiday is Easter. It is the day my Lord and Savior proved that he was the Living God and saved all who wish to be saved. My favorite author....this is a tough one, there are sooooo many....I would have to say Dean Koontz or maybe, John Grisham or maybe, CS Lewis or maybe, Janet Evanovich....It depends on what I feel like reading I guess. If I could have dinner with a famous person it would be Pope Francis, he amazes me with his openness to change and the ideas he is willing to share. I would love to be able to discuss our faith and how it has transformed into what it is today. I actually started blogging because so many of my fb friends would remark that I should blog my recipes and my stories about Mom. I was my Mom's main caregiver so I had a lot of time sitting in the living room with her while she watched game shows so I decided to give it a shot. My favorite quote is "Let it Go". It covers just about every situation. My guilty pleasure is computer games....I am addicted. My greatest pet peeve are people who are narrow minded and refuse to see outside of their own little box. Top on my bucket list is a Dive Trip to Wakatobi. In 5 yrs I see myself traveling quite often as my husband will (hopefully) be retired by then. The one food staple always in my kitchen is Olive Oil. The wildest thing I have ever done is deciding to have and raise a child at 15 years old. It was also the best thing I have ever done. Who is the most famous person you ever met in person? What is your biggest accomplishment thus far in your life? Do you prefer a large party or a small intimate party? What is the weirdest food you have ever eaten? Name one thing about yourself that you absolutely love. You....won't you please join us? It has been a pretty uneventful couple of days. Yesterday was spent at the food pantry. Today I went to Zumba, to see Mom and then came home and read for a while. It is hibernating weather around here. I thought I would post today because I changed up the Weekly Menu...not a lot, but enough to share a new recipe before I leave for choir. Originally we were going to have Smoked Sausage with Mushrooms and Onions, Buttered Noodles and Glazed Carrots. But I still have 4 heads of cabbage from my CSA that I am trying to get rid of use up so I decided to nix the carrots and have Fried Cabbage and Sausage for dinner. I also had 2 potato boats left over from Sunday so we had those instead of the noodles. This makes for a very Thrifty Thursday so I will be sharing this post there. You should stop by for some great money saving recipes, crafts and ideas. Got back to Zumba today and I am feeling pretty good. I couldn't squat or lunge as low as prior to my injury but I did much better than last week. We stopped and saw Mom on the way home but she was more interested in finding Harriet and being with her than with us so we only visited about 15 minutes and then left them to entertain each other. Last week, Grace from Life is Beautiful, stopped by my Macaroni with Kale and Creamy Pumpkin Sauce . 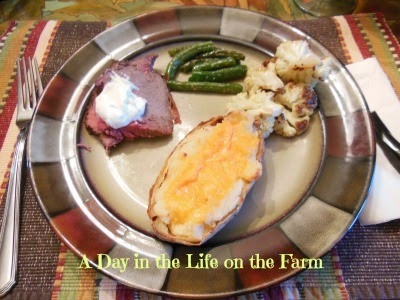 She had found me on Simple Supper Tuesday and decided to come and take a look at my blog. I am so glad she did because that got me over to her blog where I found the recipe that I am made for tonight's Try it Tuesday meal. Grace made this recipe for an October Fest party and it sounded so delicious that I instantly decided to make it this week. I had been in the mood for meatballs anyway and had planned Swedish Meatballs for dinner last week but then the menu got changed up. See......everything happens for a reason! I made some minor changes to Grace's recipe. I used seasoned bread crumbs, only 1 t. of horseradish instead of 2, I didn't add water to my meatball mixture and I had no bacon fat so I fried them in butter but had I had bacon fat I would definitely have used it! I also added a 1/2 c. of Apple cider to the sauerkraut mixture and shredded the potatoes rather than grating them. 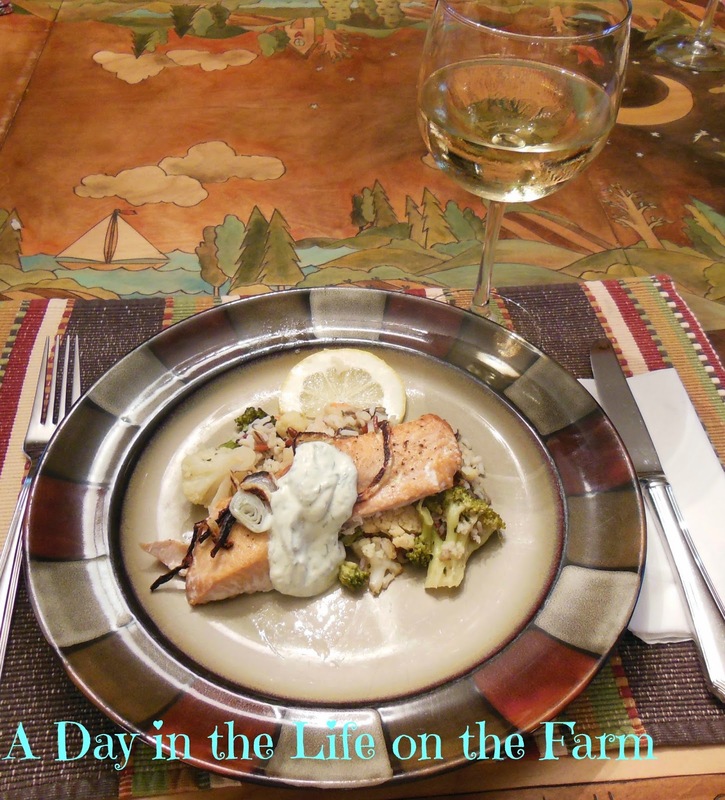 I hope you enjoy this recipe, we sure did! It is the quintessential comfort food. I had a pretty uneventful day today. Ting and Mel spent the night last night so I got my baby fix this morning and then Frank got his baby fix when Ting went grocery shopping and I went to meet my friend, Linda, for her birthday lunch. Linda's birthday was a couple of weeks ago but this was the first chance we had to get together. After lunch I went and did some Christmas shopping. Don't yell at me....I need to start early so I don't run out of time, stamina and money!! Then I stopped to visit with Mom. They were making turkeys out of paper plates and writing what they were thankful for on the tail feathers. Mom had written "my Wendy" on hers....it melted my heart. 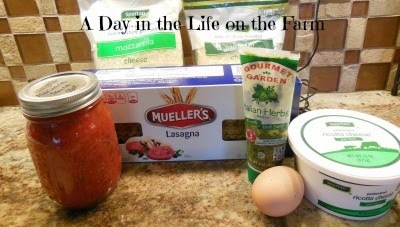 A grocery store visit and then home to make dinner for Frank who was at an afternoon meeting. I am sharing my Monicatti recipe with you. I first started making this during Lent when my children were young and Friday's were meatless. Now Monday's are meatless most of the time and Fridays are Fish most of the time and Fish and/or Meatless all of the time during Lent. I am not sure where I first got the recipe but I think it was off the back of a box of Lasagna noodles. This is a very simple recipe with very simple ingredients. You mix the egg, cheeses and herbs together in a small bowl. 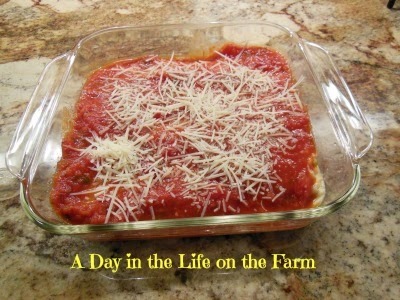 Coat the bottom of your baking pan with Marinara Sauce. 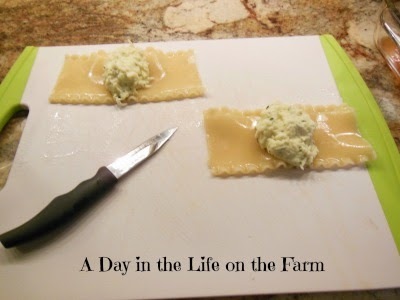 Cook Lasagna Noodles per package directions and then cut in half. Plop some filling onto each half of noodle. Roll em up and nestle them into the pan. An 8x8" pan will hold 9 Monicatti. Pour the remaining sauce over the Monicatti. Sprinkle with additional Parmesan Cheese. 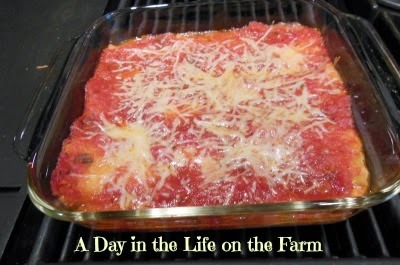 This recipe can easily be doubled, tripled or quadrupled if you have more people to feed. It also freezes well for those busy nights when you don't have time to cook. 5 Lasagna Noodles, cooked per package directions. 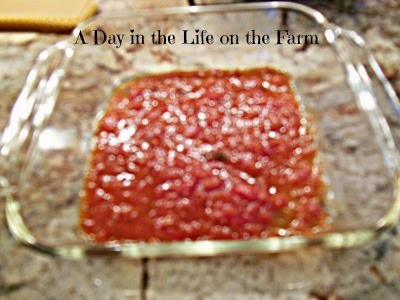 Place a small amount of Marinara Sauce in the bottom of an 8x8" baking pan. 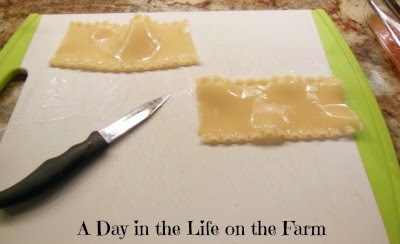 Cut the lasagna noodles in half width wise, you will have an extra half of noodle. In a small bowl combine the egg, herbs and cheeses. Place a heaping tablespoon dollop of cheese in the center of each noodle and wrap the ends around it creating your monicatti. Place each monicatti, seam side down in the baking pan, three per row. Top with remaining Marinara Sauce and sprinkle with additional Parmesan Cheese. Bake in a 350* oven for 30 minutes until hot and bubbly and cheese is beginning to brown. Hey all, It is once again Reveal Day for Secret Recipe Club. This is a great club where you are assigned a blogger each month and another blogger is assigned your blog. You sneak around the assigned blog, learn all about the other blogger, peruse all their recipes and choose one to replicate. On reveal day, everyone shares who they were assigned, a little bit about the person and the recipe that they chose. The link above will take you to the instructions and allow you to apply to join us. This month, I was excited to be assigned Dena of "Oh, You Cook". Dena is a librarian who blogs some tremendous recipes. She is good!! She is so good that she actually has a cookbook that is published and sold by Amazon! Dena has all her recipes sorted by category which is wonderful to use. I found several recipes that were calling to me and I plan to make the Majadura soup and Osso Buco in the near future. But I was looking for a Fish Friday recipe using some Salmon Fillets I had in the freezer and I hit the jackpot with her Salmon with Dill Sauce. 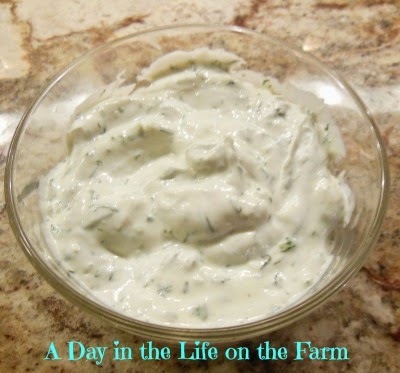 I loved the idea of a Dill Sauce instead of a Tartar Sauce for the fish. Dena was trying to replicate the flavors of a Fish Taco with this recipe and I love fish tacos! I did not have any limes so I skipped the marinating of the fish in lime juice but other than that I stuck pretty true to the recipe. Oh and I had no red onion so I substituted sweet onion. I served my fish with a Vegetable Rice Pilaf that I am sharing in a separate post so as to not take any attention away from this marvelous recipe by Oh, You Cook. 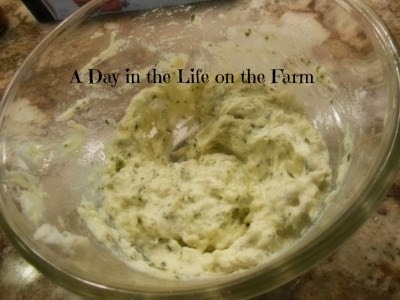 What first attracted me to this recipe was the Dill Sauce. It was bright and lovely. These are Salmon Fillets from Northern Michigan that our friend, Kurt, caught in the Spring and generously shared with us. I broiled these fillets for about 8 minutes and they were perfect. The salmon was just broiled salmon but the sauce...ohhhhh, the sauce. 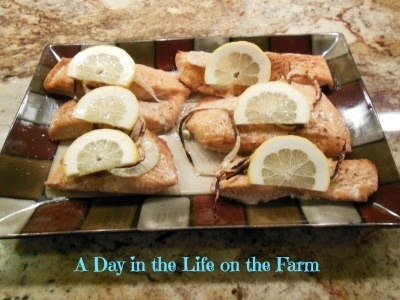 Thanks Dena for a great recipe that I will use time and again. 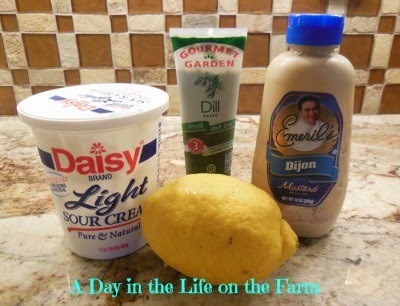 Whisk together the dill, mustard, lemon juice, lemon zest, salt and sour cream. Refrigerate until ready to serve. Preheat broiler and treat baking pan with olive oil or cover with parchment paper or non stick foil. Place fish skin side down on the pan. 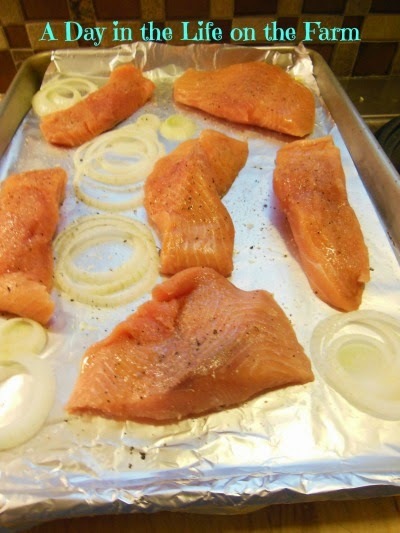 Place the slices of onion around the fish and broil about 6" from the heat for 5-10 minutes depending on the thickness of your fillets. Remove the onion prior to the fish if they start to brown too much. Your salmon is done when it flakes with a fork. Be careful not to over cook it. I am also sharing this recipe at the Inspiration Monday Party. My children's (Amy, Chuck and Jen) Grandma Moore, passed away when they were 7, 5 and 8 years of age. You know that old adage...only the good die young? It was written for her. She was a lovely woman and she was the epitome of what a "grandma" should be. She loved those kids with everything she had and they loved her right back. She was not only my mother in law but a dear friend and I miss her still. 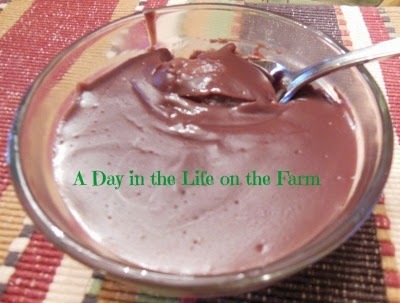 So that 35 years later, when your eldest daughter is coming for Sunday supper you attempt to recreate those memories with the hopes of seeing her eyes light up like they did as a toddler at the thought of rich and creamy chocolate pudding. I hope you will join us in our celebration of life and love remembered this day. I am including Lil's recipes for your cooking and eating pleasure. I decided to serve mine with Garlic Green Beans and Roasted Cauliflower. The pudding is Jello cook and serve made according to package directions. 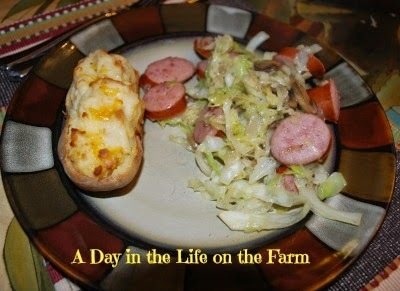 I am also sharing these memories with Simple Supper Tuesday. Stop by for some amazingly delicious and simple recipes. Season Roast with Salt and Pepper. Place in a roasting pan. Sprinkle the onions around the roast and pour broth into bottom of pan. Bake at 375* for 20 minutes per pound. 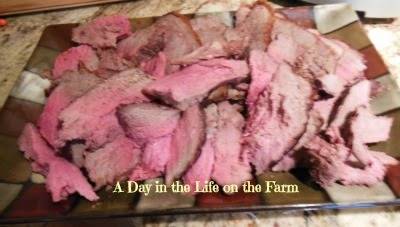 Let rest for 15 minutes before slicing thin and serving with Horseradish Sauce. Bake the potatoes at 350* for one hour or until easily pierced by a fork. Remove from oven and let cool until they can be handled without burning your hand when wrapped in a towel. Slice each potato in half lengthwise and scoop the insides out and place in a bowl leaving enough potato on the skins to keep them intact. 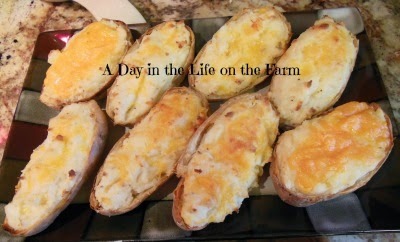 Place potato skins on a baking sheet and set aside. Place potatoes, sour cream, butter, salt and pepper in the bowl of a stand mixer and using paddle attachment beat at low speed until combined. Add cream, a little at a time until you reach a mashed potato consistency. You want the potatoes to be fluffy and stick together without being gooey and paste like.